The same holds true for fresh water. Supplies of fresh water are running dry at an alarming rate as reservoirs and aquifers dry up. Heavy overconsumption, poor rainfall and climate change have created a poisonous mix, devastating agricultural output and ravaging drinking water resources. Increased severity and duration of droughts, more heat waves, greater variation in rainfall, shrinking glaciers and melting snow and ice are already altering hydrological systems around the world. Water scarcity will worsen, meaning people and nations will compete for resources and eventually the conflict will lead to violence. More than a billion individuals — nearly one in seven on the planet — lack access to drinking water that is safe to drink. 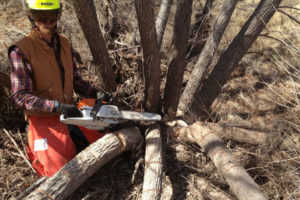 Habitat restoration is one of the five key elements — along with zero-carbon sources of renewable energy, weatherization, the elimination of our consumptive life way and mass transit — for what many are thinking of as “The Great Transition” away from fossil fuels required to solve the climate change crisis, thereby arresting the emissions of climate-changing greenhouse gases and capturing the legacy load of carbon, global warming’s most ubiquitous greenhouse pollutant. 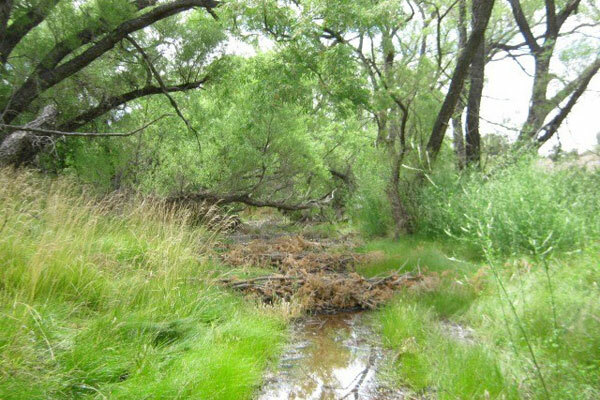 The reason for this website is to encourage others to pursue habitat restoration. We are not the best people to counsel others on the specifics of “how to” do restoration. 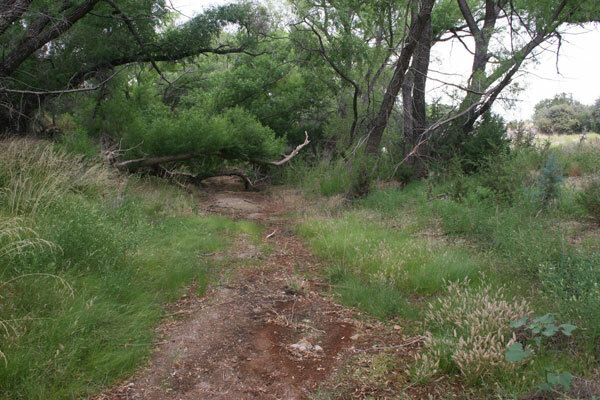 However, we have pursued it for more than a decade and know enough about it to encourage others to begin restoration, whether on a city lot or on 20, 80, 12,000 or even 200,000 acres. The process is the same. 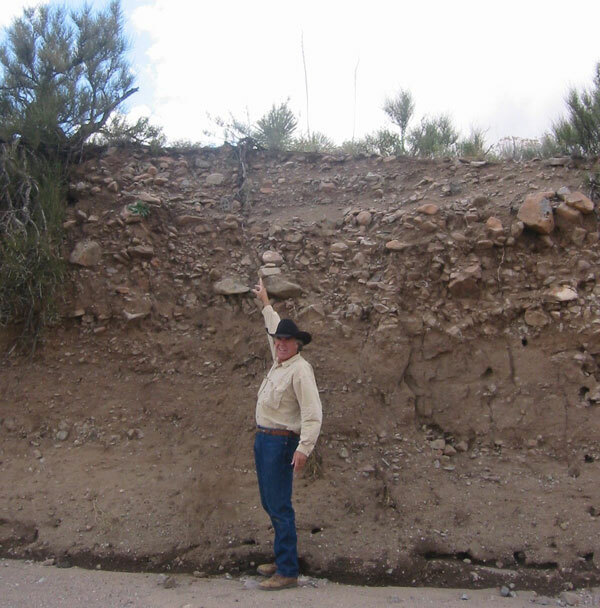 The structure pictured on the right captures 700 tons of eroding sediment in a side drainage. 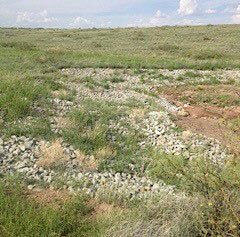 Although we have learned a good deal, have installed more than 200 grade control structures in the main Burro Ciénaga channel and some 500 structures in the 33 side drainages with the help of 14 publicly funded grants, the best way to learn how to restore habitat in the arid Southwest is to call on the experienced restoration practitioners who do the work, write about and publish on restoration techniques – Bill Zeedyk being one of the best. W.D. Zeedyk, M. Walton, and T. Gadzia. 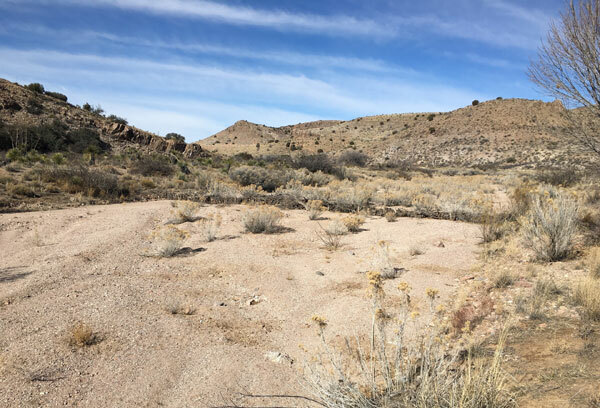 Characterization and Restoration of Slope Wetlands in New Mexico: A Guide for Understanding Slope Wetlands, Causes of Degradation and Treatment Options. 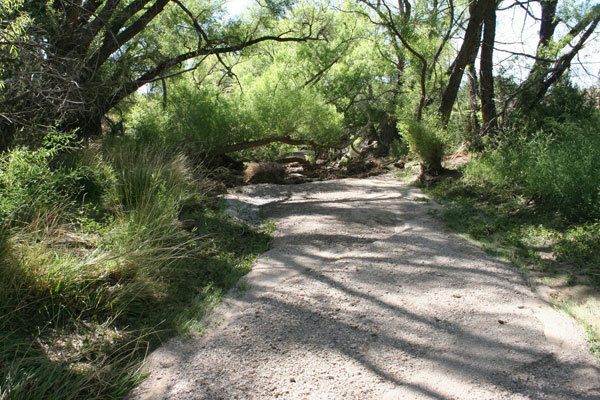 New Mexico Environment Department, Surface Water Quality Bureau Wetlands Program Technical Guide #2, 2014. These photographs below illustrate a variety of grade control structures used on the Pitchfork. Head-Cut - The most destructive culprit that contributes to erosion and channel incisions, the head-cut is a waterfall-like nick in the floor of a watercourse that creates or deepens channels. 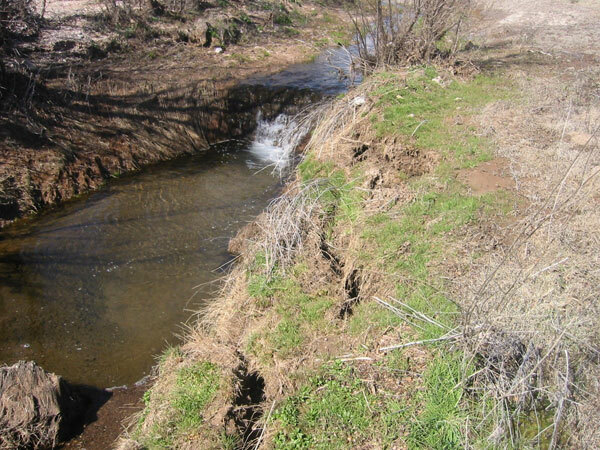 This damage to the watercourse is the first issue to be addressed in any restoration project. The water falls over the edge to the lower level and undercuts the floor of the watercourse, causing the head-cut to migrate up channel, “unzipping” ever-upward, eroding the channel and making way for another head-cut to form and repeat the unzipping process, continuing to deepen the channel. Before we began restoring the ciénaga, in 2005 we returned from a holiday, and the head-cut on the left had migrated up ciénaga, leaving an incision two football fields long and two to three car lanes wide. Channel Incision – Head-cuts can eventually lead to severe incisions like the one shown here. This photograph illustrates the depth of the Burro Ciénaga at mile six, four miles below the portion of the watercourse where the historic ciénaga is located. 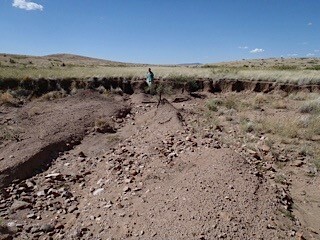 The final three miles of the nine-mile reach of the 48-mile-long Burro Ciénaga on the ranch have suffered the serious erosion pictured here. Cross Vane and Zuni Bowl - These are two photographs (top left and right) of the machine-built Zuni Bowl at Bobby’s Crossing. It was flood damaged several times and has lost a portion of the initial structure and is now more of a Cross-Vane. This structure stops the incision process and slows the water by dumping into a rock bowl to lessen velocity, captures suspended sediment in water flows, aggrades the incised channel and, with the addition of successive “tiers” installed atop this “first-tier,” will eventually eliminate the incision, allowing the water to access the terraces currently along the sides of the incised channel. 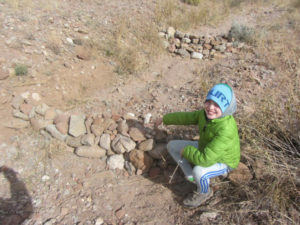 One-Rock Dam – The photograph on the left is of two hand-built One-Rock Dams constructed by our eight-year old grandson, Oliver Nix-Welke, and A.T. The photograph on the right demonstrates the amount of sediment capture in the lower half of the photograph after only two flows. A “Tier-2” structure will now be installed atop this structure. Perpendicular-Post Vane – The Perpendicular-Post Vane is an idea we developed. 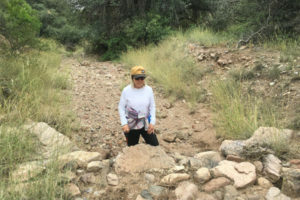 Rather than “induce a meander,” this grade control structure is devoted entirely to raising the channel bed which is necessary if the channel is to completely fill and allow the flood water to access the terraces along the side of the current channel. These are created by digging a five-foot trench and lining up posts that stick up above the channel floor about 18 inches. 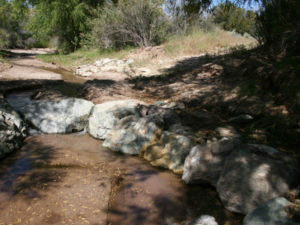 Like all grade-control structures, they slow water flow, capture suspended sediment and raise the channel floor. 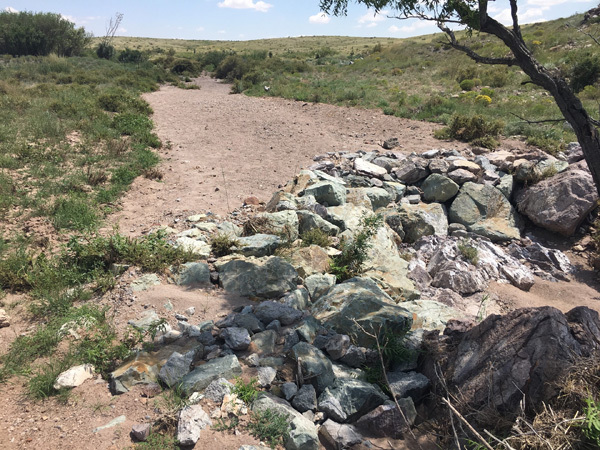 We did not realize that this structure also slows the flow sufficiently to cause seeds to drop, and you can see the thick rabbit brush in the photos below in a formerly “plant-less” channel in the single-vane structure. These plants all capture sediment as well. As an experiment, we built three versions: one with a single vane, a second with two vanes and a third with three vanes. All three survived. Thus, unless otherwise dictated by water velocity, a single-vane structure will suffice. The photographs below show examples of single, double and triple-vane structures. 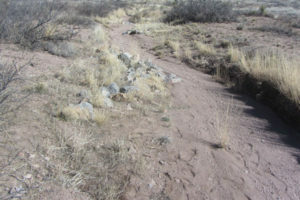 Single-Vane Structure – Note the complex growth of rabbit brush up channel where seeds drop to the channel bed when flood waters are slowed by the structure. 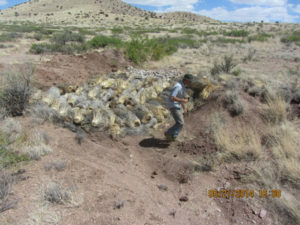 Double-Vane Structure - Note the aggraded sediment up channel on the left half of the photograph, although it is unclear why there is no rabbit brush. Triple-Vane Structure – Note the third vane near the bottom of the photograph is almost totally covered and one-third of the uppermost vane is one-third covered on down channel left. 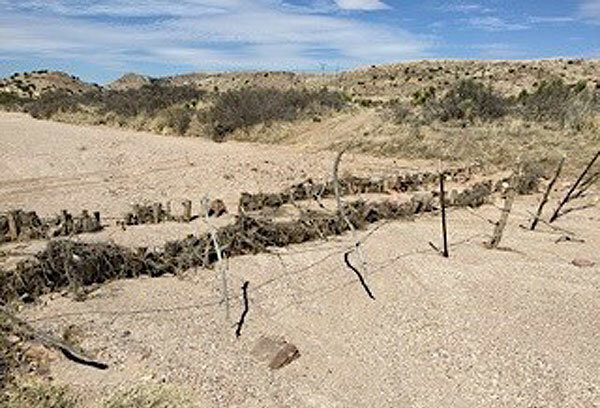 This “cut-off” channel has been raised on the order of two feet, forcing the flow into the old channel that had been abandoned in all but the largest floods and again watering a giant sacaton field that was suffering because flood waters were cut off. Boulder Barb - Where flows are peeling soil on a curve, a Boulder Barb can armor the eroding bank and turn the water away from the area at risk — in this case, turning the water down channel right. Post Baffle - Posts are inserted in each of three tractor-dug trenches, and sediment and debris are captured during flood flow. This elevates the base of the structure, eventually covering the posts, creating a meander down channel left, harvesting soil from the left bank and depositing it to create a point bar below the structure. Boulder Baffle - This is a machine-built Boulder Baffle that has the same effect as baffles made of posts, forcing water flow leftward in this picture toward inducing a meander that reduces water velocity seen in long, straight channels. Induced meandering transforms a straight watercourse to meander left and right, creating an “S” shape the extends the length of the watercourse. 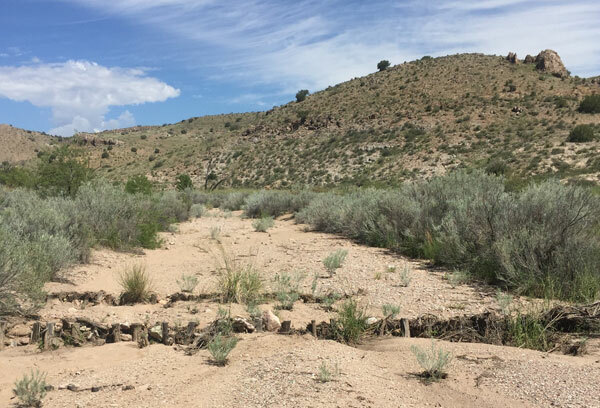 The eight-and-one-half-mile-long reach of the 48-mile-long Burro Ciénaga watercourse on the Pitchfork Ranch is now on the order of nine miles long. Note the debris atop the structure, indicating the depth of the flood waters. 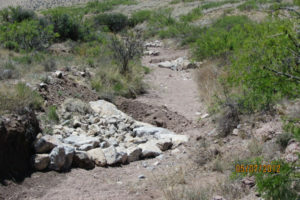 Side-Channel Boulder Baffle – The goal of grade-control structures is to keep all the rain that falls on the ranch and at least slow the water that leaves. Slower run-off wicks more, wets plants and raises the water table. 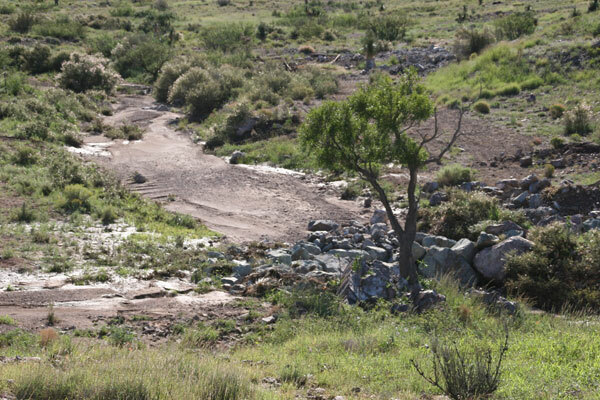 This series of structures creates a meander in a side drainage that eventually reaches the Burro Ciénaga. The photograph on the left was taken shortly after the structures were installed and before rain, while the one on the right, post-rain, demonstrates how these structures created a meander in an otherwise straight channel. Step-Down Woven Weir - Hand-built Step-Down Woven Weirs are constructed from pointed wood posts (gathered from the removal of 348 acres of juniper trees on the north portion of the ranch), which are sledge-hammered into the channel bottom and (initially) then woven with juniper branches and now willows that sprout branches that grow vertically and aid in capturing sediment. 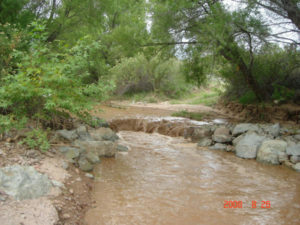 There are three same-location photographs shown below: the first picture was taken before the initial set of weirs were installed; the second, after installation; and the third, after several floods covered the first tier. As of 2017, there are three sets of three woven weirs, each installed atop the other and pending a “Tier-4” set. To restore the incised ciénaga channel on the ranch will take at least eight tiers of three rows as shown here. 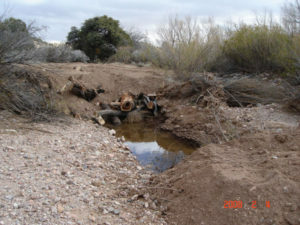 Engineered Logjam – This construction stops water flow from passing through a cut-off. 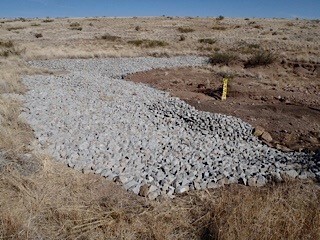 Cut-offs typically straighten an incised channel, eliminate a meander, accelerate water flow and deepen the channel. Before fast water created this cut-off, the flow angled right around a bosque, finally cut through it, and shortened and straightened the waterway, thereby increasing the flow speed. Machine Built Structures – Most of the grade control structures — more than 1,000, total — are built by hand, either pounding posts into the watercourse or positioning rocks for One-Rock-Dams in the 36 side channels or canyons that drain into the ciénaga. 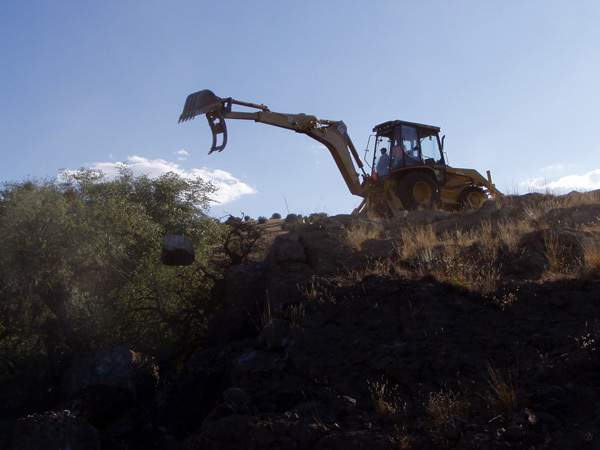 Larger structures like the Cross-Vanes, Boulder-Barbs and Boulder-Baffles pictured here require a backhoe with a thumb to place large boulders in a position where the flow will tighten the structure as it captures sediment. 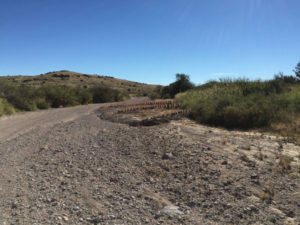 As of 2017, there are several hundred machine-built grade control structures on the ranch, many of which, like the one pictured on the right, will have a “Tier-2” structure built atop the initial tier once it has captured a full load of eroding sediment. This structure has captured 1,100 tons of sediment. 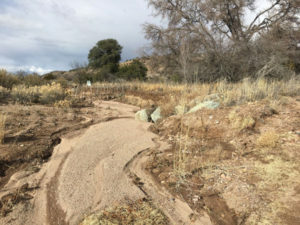 Slope Repair - The three photographs below show restoration in a grass swale in the flatlands on the southern portion of the ranch. 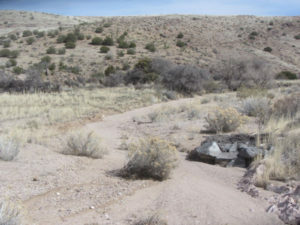 This is similar to “slope repair” and the use of rocks for a “run-down” referred to as “Yucca-Stump Run-Down.” The vertical soil shown in a brown line below the skyline is essentially a valley-wide head-cut that causes erosion as pictured in the initial two photographs in this section. Note that The Nature Conservancy’s Karla Sartor, who oversaw this restoration, is shown in the first photograph standing at the base of an incision that is above her waist in height. The second photograph shows the hand-built rock run-down installed after the vertical drop-off was shaved to a gradual slant. The third photograph is of the same location one year later, and the video demonstrates the restoration at flood stage. Hinge Felling - Zeedyk-developed grade-control structures use live willows that often line the incised channel of a damaged ciénaga. 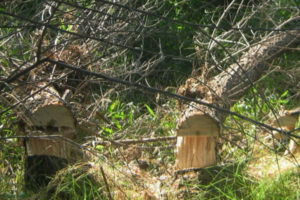 The tree is cut half way to its center close to the ground and notched four times to avoid “barber-chairing” (which leaves the tree with half a stump and half a trunk, resembling a chair with a high back), leaving the half stump to sprout new growth and the top portion to be laid horizontally across the watercourse, allowing new vertical branch growth to capture sediment and debris. Rather than requiring additional tiers like those atop structures that have successfully “captured and covered,” this structure continues to grow vertically and, in effect, replicates itself.